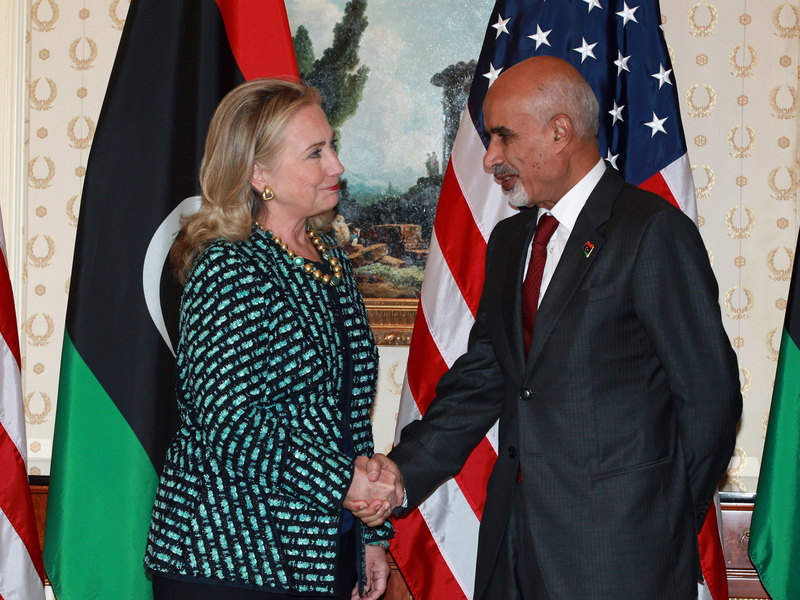 (CBS/AP) U.S. Secretary of State Hillary Clinton met Monday with President Mohammed el-Megaref of Libya - the first high-level meeting between the two nations since the U.S. ambassador and three other Americans were killed in a Sept. 11 attack on the American consulate in Benghazi. Clinton thanked el-Megaref for his government's help in the aftermath of the attack and praised the Libyan people for overthrowing Muammar Qaddafi last year. A U.S. official tells the Reuters news agency she also offered Libya's central government more support as it tries to assert control over cities where hardline Islamic militias had become the de facto security forces, and to secure vast stockpiles of weapons left by Qaddafi's regime. "The secretary offered to intensify our support and help for the Libyan government in all of those areas," the official told Reuters after Clinton's meeting with el-Megaref. "What happened on (the) 11th of September toward these U.S. citizens does not express in any way the conscience of the Libyan people, their aspirations, their hopes or their sentiments toward the American people," he said. CBS News correspondent Elizabeth Palmer reports that Libyans angered by the harsh, Islamic law-inspired security practices of the well-armed militants - many of whom were viewed as heroes during the uprising to topple Qaddafi - staged a series of protests across the country on Friday and forced many of the groups out of their offices. In the mayhem of the protests, Palmer says it was impossible to tell where the ousted fighters escaped to - including members of Ansar al-Sharia, the group suspected of attacking America's consulate in Benghazi. Even if the Libyan authorities knew where to find the militias, however, it is unclear how prepared the military is for a battle against the Islamic fundamentalist groups. The central government and military remain relatively weak in relation to the territorial militia groups - which have been quick to pounce on the weapons depots left behind by Qaddafi's troops. "It will not be an easy step for the government, but the government has to do it - to show its authority, its strength, to impose the respect of the law," Libyan Ambassador to the U.K., Mahmoud al-Nacua, told CBSNews.com on Monday. "It may be that we will face some difficulty, some delay, but when they (the military) start, I think the people will support it in many cities." Al-Nacua said the government would attempt to negotiate and bring moderate militia groups under the umbrella of central government - if they were willing to accept the government's authority and respect the rule of law. "Prime suspect" in Libya attack dares gov't: "arrest me"
Other groups - such as Ansar al-Sharia, which has an ideology more closely aligned to al Qaeda than a domestic security force - will face an ultimatum, said al-Nacua. "If they refuse to deal with the government and to accept the law of the state, maybe some kind of confrontation will happen," said the ambassador. The leader of another prominent brigade in Benghazi, Ahmed Boukhatala, told CBS News' Palmer last week that he fully expected such a fight was looming on the horizon, and he didn't seem at all nervous.